Dear Gabacho: Same reason we put worms in tequila bottles, celebrate Cinco de Mayo and star in Beverly Hills Chihuahua: to cheat gabachos out of cash. To paraphrase the classic dictum: A gabacho and his money in front of a Mexican tourist trap is a gabacho who deserves the Reconquista his wallet receives. Dear Still Terrified of East Los Angeles: “Pachuko Hop” by Chuck Higgins—now that was the jam! All assertive horns, swinging rhythm and a trumpet that bounced like the chichis of a fine ruca … but I digress. There was really no reason for you to fear the pachucos, unless greasers, hippies, bobbysoxers, hipsters and every American youth movement also gave you the willies. Pachucos were nothing more than Mexican hep cats: guys and gals who dressed in zoot suits and other fine tacuches, liked to neck, spoke a unique argot called caló and engaged in the occasional knife fight. Their roots span everywhere from El Paso (known to natives as El Chuco, and from where the pachuco name derives) to Harlem’s Cotton Club (the primal pachuco is Cab Calloway, who popularized the zoot suit) to that fount of genius called the American spirit, which infuses youth with a restless energy. 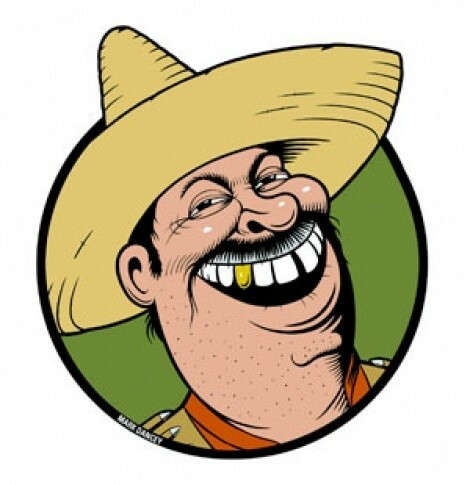 The only reason you associated pachucos with delinquency is porque the ravenous press, which labeled them as outlaws and inspired the infamous 1943 Zoot Suit riots, where many gabacho sailors and soldiers practiced their basic training by beating the living caca out of pachucos. Like all American juvenile “delinquent” movements, pachucismo eventually faded away, and its only real legacy is the zoot suit, which many Mexican teenage boys wear if they appear in a quinceañera, the amazing Luis Valdez play and movie, Zoot Suit, and an easy dissertation topic for Chicano Studies majors. Dear Demon: Everything is wrapped for Mexicans. Our tamales. Our food inside a tortilla. Ourselves around someone else as we prepare for a cramped trunk ride across the border. Babies get the burrito treatment to protect them from the elements, to transform them into a shape better suited for lugging around and to ensure the proper crisp their skin needs to achieve that wonderful Mexican mocha-brown. Congratulations to: Henry Cejudo, who won an Olympic gold medal in the 121-pound weight class for freestyle wrestling. He was born in los Estados Unidos, but both of his parents were Mexican illegals, which makes Henry an anchor baby. Let’s see, Know Nothings: Anchor babies have died in Iraq, changed the diapers of catatonic elderly gabachos and won Olympic gold for the Stars and Stripes. The only thing I ever see ustedes do is whine. Who better serves the States again? Get all your Mexican fun at MySpace.com/ocwab, YouTube.com/askamexican, or ask him a question at TheMexican@askamexican.net!